Kings Langley followed up their excellent win over the league leaders with another victory in midweek to move further clear of the dropzone. Three days after beating then-table toppers Weymouth last Saturday, Kings travelled to the bottom side Staines Town last Tuesday night and came away with a solid 2-0 win. 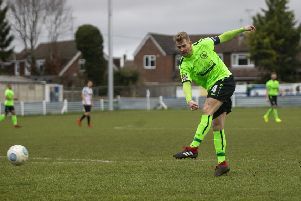 The six points gained in this span has pushed Langley into 16th place in the Southern League Premier Division standings and five points clear of the bottom three. For the second away match running, the game was played against a backcloth of continuous rain. Those conditions appear to be to Kings liking, as they again came away with all three points and a clean sheet. The two teams had met many years before with Staines recording home and away victories in the Parthenon League in 1952-53. Now, 65 years on, Kings gained a measure of revenge. With Junior Osborne out, Kings switched Gary Connolly to the centre of defence and gave a second start to Toby Syme at right back. Kings began in dominant fashion, penning Town in their own half for the first 10 minutes. Mitchell Weiss and Stevie Ward had shots just off target, but Staines came back and Wilson Chingoka broke through to shoot narrowly wide, before a sublime lob of the keeper by the luckless Weiss hit the post, a feat repeated by what at first seemed an innocuous cross by Town’s George Pilbeam. With Kings unsuccessfully appealing for offside, Connolly was forced to clear off the line. It was a first-half of plenty of effort but no reward for both sides, ending with the visitors’ Rene Howe heading a Dean Hitchcock free-kick past the post. The second period began with the hosts gaining in confidence, but as half-chances came and went at either end, the game became bogged down. Then, with 15 minutes left, a ray of skill came from Howe as he played a through ball to Weiss to leave him one-on-one with Town keeper Louis Dixon. The striker is in the midst of an unusual barren patch and it showed as Dixon got a hand to the shot to turn the ball loose. Some would have vented their frustration, but to his credit Weiss chased the ball wide, turned and sent in a perfect cross for an unmarked Luke Wade-Slater to head in at the far post for a 1-0 lead. Kings sealed the victory in the last minute with an audacious goal. Howe took the ball to the corner flag but turned, beat two defenders and drove on to beat Dixon with a shot from the narrowest of angles. It was a fitting finale to a good night for Kings and just reward for another unselfish display from the experienced front man. After having Saturday off, Kings were due to be in action again last night (Tuesday) as the Gazette was going to press when they hosted fifth-placed Hendon in the league. They then entertain 15th-ranked Basingstoke Town this Saturday.